From A'Lelia Walker to Bevy Smith, black women have often used these gatherings as a way to inspire and connect. Ten years ago, host and social entrepreneur Bevy Smith became known for her dinner parties in New York, which she called “Dinners with Bevy.” In 2008, Smith, a Harlem native, was unemployed and looking for a way to use the connections she had accumulated through years of work experience in luxury fashion and journalism. Her dinner parties connected black artists with mainstream fashion brands and allowed her to flex her muscles as a hostess and an influencer. Smith is continuing a long tradition of using dinner parties as a cornerstone for curating black joy, one of the greatest themes in black history. For black Americans, that joy is rarely euphoric. Throughout history, it is often juxtaposed against some memory or experience of trauma or oppression. During slavery, Christmas was the holiday that slaves often looked forward to the most. It was a time of the year when owners temporarily treated their slaves kindly — if only to reinforce slave mentalities — and slaves found a way to strengthen their bond with one another by giving gifts, playing games and throwing “dinner parties.” Despite the dire circumstances, they still found a way to celebrate, and that practice has continued for centuries. In 1926, the poet Countee Cullen wrote in "From the Dark Tower:" “We shall not always plant while others reap. The golden increment of bursting fruit. Not always countenance, abject and mute, that lesser men should hold their brothers cheap.” Cullen, a Harlem native and a patron saint of the Harlem Renaissance, wrote the poem about the hardship, hope and beauty of being black after Reconstruction, but before the civil rights movement. During this time, Cullen’s friend, Madam C.J. Walker’s daughter and heiress to her fortune, A’Lelia Walker, hosted soirees in her townhouse on 136th Street in Harlem. Walker named the townhouse’s party space The Dark Tower, after Cullen’s poem, and turned the place into a space of abundance and fellowship. She attracted millionaires and artists from all over the city, who would gather for parties that were as “crowded as the New York subway at the rush hour,” poet Langston Hughes wrote in his autobiography. Walker was crowned the “joy goddess of Harlem” by Hughes, and The Dark Tower was not just a meeting place during the Renaissance, but also a center for black joy, a microcosm of artistry and grace. The parties were also known for being a safe space for queer people, NPR reported. 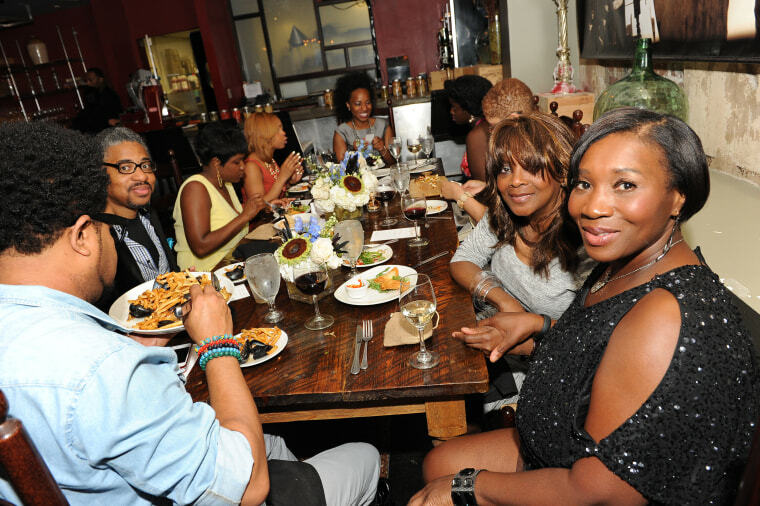 Walker is just one example of a legacy of artists and influencers who’ve adopted dinner party curation as their preferred method of connecting with other black artists. Smith, the social entrepreneur, followed right in Walker’s footsteps. She grew up on 150th Street in Harlem and counts her mother, barmaids in 1970s Harlem and Madam C.J. Walker as her inspiration. Smith had multiple motives in starting her dinner parties. She wanted to connect and inspire, but also to monetize her relationships and skillset, particularly for black artists who had limited access to luxury brands. Of course, contemporary dinner parties aren’t just happening in New York. Nichelle Tramble Spellman and her husband, Malcolm, are accomplished writer-producers in Los Angeles and host dinner parties about six times a year for their friends, a squadron of black artists and professionals in Hollywood. In a community that can be isolating, Tramble Spellman creates a space where friends and peers can relate to one another in an intimate, festive environment. Ten years ago, Tramble Spellman started hosting friends for dessert parties. She hosted her “biggest dinner yet” for Christmas 2018. However, 30 minutes before the party was set to begin, a windstorm ttied to steal her joy.